Cape Elizabeth Land Trust » 14th Great Maine Outdoor Weekend, Sept. 21 through Sept. 30. 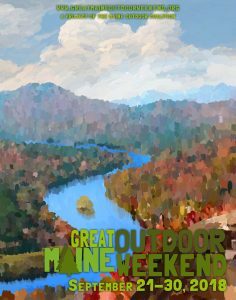 14th Great Maine Outdoor Weekend, Sept. 21 through Sept. 30. Thousands of Mainers are expected to participate in the Maine Outdoor Coalition’s 14th Great Maine Outdoor Weekend, from Sept. 21 through Sept. 30. The event has been expanded to encompass a full week to give more organizations a window to participate and allow for weather rescheduling. The Great Maine Outdoor Weekend is a series of events led by outdoor oriented organizations and companies to celebrate the how, where, and what of being active outside in Maine. Our goal is to connect our friends and neighbors with the natural world, to promote fun, physical activity, & good health. Activities will occur across the entire state of Maine, in all counties. Many will be free and at an introductory level. See what’s in store for you all across Maine! Kicked off by our own Harvest Party on Saturday and Cottontail Walk on Sunday (click to register), other events range from bird migration monitoring at Schoodic Point, Fort Gorges Kayak Tour in Portland, and a Happy Apple Trail Ride in Sanford. Take advantage of the great weather ahead and get out doors this week!